Who doesn’t like a friendly challenge in the form of online multiplayer games? Let’s face it, playing against NPCs can get boring and really only tests your skill up to a certain level. Even with all the advancements made to AI bots, humans just play, move and react differently than bots do. Multiplayer still plays a huge role in gaming and especially online gaming. So, what are the top online multiplayer games that we can get into for free? With absolutely no investment, no download needed and no cost, this list of the best free online games will have you competing against players world wide in your pursuit of glory. Krunker is a fast paced FPS reminiscent of Call of Duty or Team Fortress 2. Although the graphics are simple and blocky, the game runs great right through your browser. It’s one of our favorite best free online games released recently. The game cycles through game modes like Free for All, Team Deathmatch, and Land Grab if you stay in the same lobby. Up to eight players can join in either custom matches or random matches through the servers. Choose from over a half dozen classes with various weapons and skins. Krunker is great because it can played for free, with no download required. Players can either jump straight into a match as a guest or create an account in seconds so that your stats are saved and you can earn credits. It’s a simple game to hope into for ten minutes or several hours at a time. Controls are intuitive and easy to use for anyone familiar with the FPS genre. There are only two maps at the moment but both are well designed and allow for player creativity and spontaneity. Every match is a new experience! With a maintained or growing player base, we are sure to see some new map additions or perhaps even new classes and weapons in the future. If you haven't played Slither.io yet, it’s time to join the revolution. 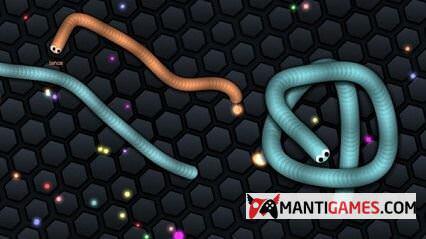 Slither.io is a free online multiplayer game available for free through your browser. No download is required! Simply give yourself a username and start gobbling up your competition. Slither is widely considered one of the best recent browser games. Most people have probably played some version of the b, Snake. It’s one of the oldest and most beloved cell phone games of all time. The game is simple: control your snake and eat the little dots that appear on the screen to grow in size. The game is over when the player runs into either themselves or a wall. Slither.io takes this simple idea and tears down the walls. Now instead of fighting against a confined space, your snake will have to survive against dozens of other players online! The premise remains the same: eat as much as you can and grow as large as you can. Now you can also destroy and eat other players as well, however. How large can your grow? Will you reach the top of the chart on the server? Watch your back! There may be another snake coming to take your top spot. Get into games quickly and restart on a new server if you get taken down by another player. There’s hours of fun to be had and nothing to lose with Slither.io. Jump into this hot browser game and enjoy every second. Grand strategy games have been around for quite some time and boast some very in depth gameplay. Games like the Total War series and Europa Universalis can be engrossing and often take days to finish, but what if there was a simpler version of the grand strategy game? Illyriad fills this void by providing a free, no download required option to gamers. Play against friends or strangers over the internet and expand the reach of your kingdom as wide as you can. Maintain your population, grow your resource pool and build new expansions. Will you be a ruthless tyrant, hell-bent on crushing every enemy civilization? Or will you work with your neighbors, establishing trade and growing stronger together? The choice is up to you. All you need to do is register your email address and start playing for free right through your browser. Take over the world with Illyriad, one of the best browser games for total time sink. Zombies? Check. Shotguns? Check. Online multiplayer? You bet. Dead Frontier 2 is a straight forward zombie survival game. The best part about this game is that you can play for free and don’t have to download anything. The game is graphically very impressive for a free browser game. Controls are intuitive for players familiar with third person shooters. The game could be compared to popular big name titles of the past like Left 4 Dead, but Dead Frontier makes a name for itself by being a true MMO, open world survival simulator. Scavenge for guns, supplies and food with a group of friends, or just with some friendly strangers trying to survive the apocalypse. The game offers tons of perks to keep you playing like a level and stat system, and frequent updates with new zombie and items. Find out how long you can survive with Dead Frontier 2. Blast Arena will be a blast from the past for many gamers. This free online multiplayer game lets you relive the excitement of Bomberman all over again. Play the best games from your browser now and start blowing up the competition. Blast Arena looks almost exactly like the old Bomberman games and is just starting to grow in popularity. As the game ages we will be sure to see many more player skins, more bomb skins and new maps. Currently there are three player slots in a lobby, but even larger games could grow into a bombing frenzy! Blast arena has easy to grasp controls: arrow keys to move and space to plant your bombs. Blow out rocks blocking your passage but be sure not to get caught in your own explosion! Work your way across the map collecting power ups to increase your speed or bomb strength. Eventually you will come face to face with other competitors (maybe your friends!) and it will be up to your speed and cunning to blow them up before they can blow you up! Last edited by davidspen on 19 Nov 2018, 03:21, edited 3 times in total. Re: I lost all old data ???? If you removed tracks while your android was active (like removing SD) it is lost forever. The database is maintained by Android and not by Cross. Any track removed by the database process. When you add tracks (insert SD) the mediabase considers this as new tracks. Even if located at the same location.